Start from Los Angeles Union Station on AMTRAK Coast Starlight train with large windows, dining car and observation car. The seats are wider and more spacious than most airline or bus seats. This overnight two-day trip goes through the "Middle Kingdom" of California. Far from the metropolis and thrill rides this relatively unknown part of California will surprise you. 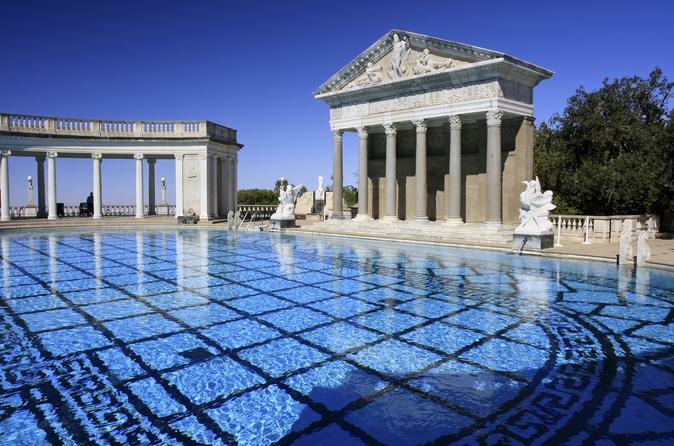 Ride along the most scenic Santa Barbara Coast, restricted Vandenberg Air Force Base, spend a night in small town San Luis Obispo or Paso Robles and tour Hearst Castle high above San Simeon. Return to Los Angeles by 9:00 p.m. on second night. OR go on to San Francisco. Instead of flying between the two cities this relaxed trip will give you time to recover from the big city activities and see cattle ranches, horse farms, oil fields, miles and miles of vineyards, agricultural areas and fertile Salinas Valley chronicled by John Steinbeck and other famous writers. You reach San Francisco by 10:00 p.m.
Day 1 - 9:00 a.m. Check in at Los Angeles Union Station for AMTRAK Coast Starlight train # 14 leaving at 10:10. Riding through San Fernando Valley you reach Pacific Coast at Ventura and continue on Santa Barbara Coast through the restricted Vandenberg Air Force Base from which rockets are launched. On through strawberry fields, small coastal towns and vineyards you reach San Luis Obispo at 3:30 or Paso Robles at 4:45. Short cab ride to your hotel. Day 2 - 7:40 a.m. Pick up by Wine Wrangler with a driver/guide in a small vehicle for a trip to Pacific Coast through Morro Bay to San Simeon for a 2 hour tour of Hearst Castle and then Elephant Seal Rookery with a picnic lunch. Return to San Luis Obispo to board Coast Starlight train leaving at 3:30. ride through Paso Robles, Camp Roberts, then along Salinas River past oil fields and vineyards. Riding through the valley a brief stop in Salinas then through fields of artichokes and strawberries to Moss Landing. See the unique Elkhorn Slough of Monterey Bay. The train crosses the San Andreas Fault Line near Gilroy and comes through San Jose and Silicon Valley to marshlands of ecological bird sanctuaries in the marshes of San Francisco Bay. Arriving in Oakland around 9:30 you are transferred to San Francisco.